My first rocket memories are of my dad showing my brother and me an unpainted 3-stage Estes Astron Farside when I was four. My dad was big on simple paint schemes. I recall orange overall (as in Testors competition orange) and perhaps a white nose cone, though maybe black was applied as well. 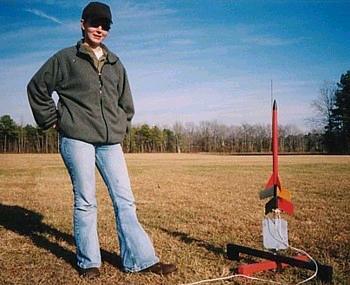 Shortly thereafter the rocket was painted and then flown from a local school, losing one of the lower stages. The remaining stages were given to me, but that model was not flown again. I credit that experience (thanks, Dad!) 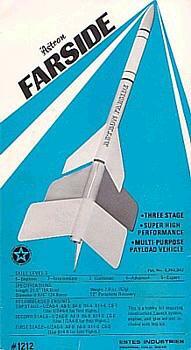 plus the first Space Shuttle launch as the primary inspirations for a life-long love of model rocketry. The Farside remained a favorite kit, and to my great surprise was discovered again at a local hobby shop which had all sorts of kits with older style cards (see example above) while I was still in elementary school. I attempted to recreate the color scheme of my first rocket but with embellishments (I took my cues on detailing from the illustrations in the Estes Tech Report TR-2 on multi-staging that came with the kit–see Ninfinger.org link and cropped image to the right). The first (or second) flight resulted in a lost upper stage, despite using the smallest available motors, leading me to rebuild the upper stage. That was the first time I ever ordered from Estes’ parts catalog and the first time I ever had to cut a body tube. Jess built her Farside in 2002 using the instructions from my old Farside kit, but substituting the balsa fins with 1/16″ basswood for ease of finishing using spray primer alone. For her version, she eliminated the payload section entirely and lengthened the model using a stock 18″ BT-50 for the upper stage. She also added a launch lug to the upper stage (normally only a long single lug on the second stage) to allow for single stage flying. She gave the model a nice smooth finish by applying Testors Acryl paint with an airbrush. So far, Jess has flown it several times with complete success, using a streamer for the third stage instead of a parachute (I highly recommend using a streamer to better ensure recovery of this high-flying design). One of these days I may build another one, too. The kit instructions list the BT-50H as 7-1/2” long; this is clearly an error as this information is not consistent with the Parts Catalog listing or the actual measurement taken of the kit part. 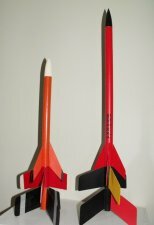 Gerry Fortin’s Model Rocket Database — Scroll down for several links for K-12/1212 (Farside) and K-12X (Farside-X) with photos of kit packaging and catalog images.